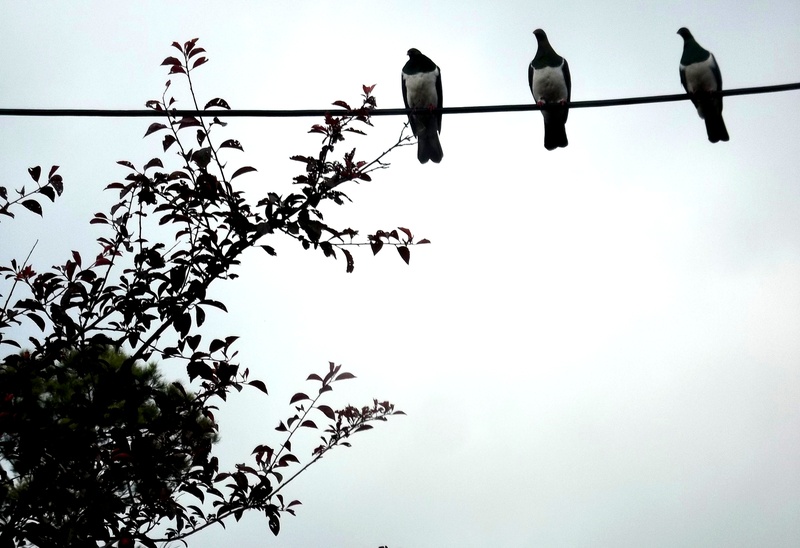 Not a picture of hear no evil, see no evil and speak no evil, but a picture of the three fat wood pigeons sitting on the power line outside our house yesterday. They used to be plentiful, but between the Maoris and the settlers they nearly became extinct. They’re now protected, and their numbers are increasing. The Maoris call them kereru, we call them wood pigeons. They are precious to us. This morning, waiting for the kettle to boil while I made a cup of tea to take back to bed, I stood at the bench looking out of the kitchen window, and watched one of these pigeons in the guava tree. As he swallowed the guavas whole, they travelled down his throat and then the lump disappeared into his white curving bosom. I was fascinated to see how this big heavy unwieldy bird kept his balance on the thin frail branches. He moved from fruit to fruit, gobbling them up, without ever looking or checking to see where his feet/ claws were going to find a secure foothold. The feet moved with an intelligence of their own. Once, the twig bent so much, the bird keeled over, and his wings flapped open to hold him, as his feet found a better foothold. Enough being enough, he whirred heavily out of the little tree shortly after, and lumbered off. The tangy red guava berries are small and sour this year, with no rain to swell them, so I’m leaving them all for the birds. I took the tea-tray back to bed, and lay back on the pillows looking out of the window on the other side of the house. The loquat tree, just beyond the window, which is covered in blossom, was rustling and shuddering. A turquoise and black tui was enjoying the blossom, seeking the honey, long beak pushing aggressively into the flowers, and plunging from one bough to another, with the same sure-footedness as the wood pigeon. As I watched this bird, with his bright white bobble of feathers jiggling at his throat, which caused the early settlers to call him the parson – bird, I felt I was watching something familiar, and then I remembered. As the tui sucked the honey, his tail waggled back and forth in an ecstasy of concentration, just like the tails of lambs when they are suckling their mothers in the fields. During the nightas I turned over in my sleep, I heard a morepork, the New Zealand owl calling, very close; later, the huffing of a possum in the loquat tree, which sounds like the hissing of a python and what I feared were rats rustling in the roof above. I hoped the hedgehog I found yesterday was on the move in the garden drinking, eating and making merry by the ivy. I seemed to be inhabiting a corner of the universe where other creatures were getting on with their lives oblivious of homo sapiens. When I drove through the little hamlet at the edge of the sea on my way to shop the other day, I slowed down when I saw a couple of ducks crossing the road. I stopped a good fifty yards away from them, so they wouldn’t feel hassled, and was tickled to find them being followed by at least another twenty waddling, feathered bodies. When I slowly drove past the drive where they had all disappeared, I saw there was a feijoa tree hanging over the fence, and the ground was covered in the fallen green fruit. The ducks were feasting… how did they know the fruit was there, that this drive was the only way to get at it, and that this is the time of year for fallen fruits? Their intelligence is of a different order to ours, and it works for them. It being the beginning of the duck shooting season in a few more weeks, they will soon all congregate on ponds they know are safe from hunters, in city parks like the duck pond in the Auckland Domain…. And on the way home I dodged a quail family scuttling along the side of the road with half a dozen speckled brown babies. In our last house, I once looked out of the window and saw a veritable army of quails advancing down the drive… eleven to be precise, four adults and seven tiny powder puffs on wheels. They all scattered over the lawn, while the four adults stood one at each corner, with their backs to their babies, guarding them.. When the babies had finished, the adults marshalled them, and moved off, with one adult bringing up the rear, and keeping the stragglers in order. An exquisite example of responsibility, co-operation and parental love. And so as I catch in a glass the bumble bee which has just blundered into the house, and is buzzing angrily at the window, I release it outside, sending it on its way with a blessing, knowing that we are all fellow travellers and all connected by Spirit. My life, like many, is not so much a drama as a tale of tiny things. But in the end they add up to a life. This is the tale of a few days of this week. Tuesday When I walked through the cemetery to the marble bench to sit in the sun, the grass seemed to be sprinkled with flowers like pink confetti. They were bright pink with yellow centres, the size of primroses, but only growing half an inch from the ground. I sat on the warm bench and looked over the turquoise harbour. A monarch butterfly floated across and came to rest on the purply-blue flower of a creeper in the tangle of shrubs leading down to the water. I watched the orange and black wings spreading over the amethyst flower, and watched it lift off again, and swoop and flutter in a wide circle before coming back to the same flower. It then drifted to another flower head, before settling on the grass, presumably to digest its meal. When it rose again in the air, it dropped down to a shrub where another monarch was already feasting. The two rose in the air, fluttering and dodging around each other, until my butterfly was driven away, and did a wide arc halfway round the cemetery, before coming back and settling on another bush. I drifted back home, missing Cara the cat, and realising that when she had stopped coming with me but sat by the gate, and then, didn’t even cross the road, but sat by our path, waiting for me to return, she wasn’t being cussed – she was obviously too weak or weary in those last months to come springing across the grass with me, her tail held high, and perfectly straight. Wednesday Went for a walk to get away from the problems besetting me in the house. I passed a monarch butterfly fluttering on the pavement. It’s wings were almost completely chewed away, presumably while still in the chrysalis by a voracious praying mantis, but its head and body were intact. It lay there, fluttering the fragments of its ragged wings. I put it in the grass, and went for an illegal wander round Liz and Richard’s empty beautiful garden looking over the harbour. On my way back I looked, and the butterfly was still struggling. I nerved myself to carry it to the pavement so I could stamp on it and put it out of its misery. I laid it down, and it spread its pathetic little rags in the sun, and I had the sense that it was enjoying the sunshine. I just couldn’t bring myself to stamp the life and the consciousness out of it. So I carried it gently back to the grass, and laid it in the sun. The colours today are like summer, aquamarine sea, and snowy white foam as the waves dash onto the rocks below. The sun shines, and a bitter wind blows. It seems to have been cold for weeks, so we’re chomping through the walls of logs piled up in the garage. It was hard to go out tonight, but I’m glad I did. Our monthly meeting when people talk about their life. Journeys, we call them. A woman who lives nearby told us how she had dissolved her three generation family business in fashion, and looked for somewhere in the world to serve. She ended up teaching in a Thai monastery, where her experiences there and at various healing sanctuaries were life- changing. She was glowing. Thursday Another bitterly cold day with the sun shining brightly. But the oak tree is shimmering with its new spring green, the crab apple has pink buds peeping out, and nasturtium and arctotis are beginning to spring up in their lovely untidy sprawl through the other greenery. A clutch of tuis are sucking the honey in the golden kowhai trees across the road. They are all covered thickly in their hanging yellow flowers along the roadside, and always seem like the heralds of spring. Yesterday I got my sweet cleaning lady to help me rip down the white sheets which serve as a canopy on the veranda in summer. Have n’t had the strength in my arthritic hands to do it myself. I’ll wash them and use them to cover things in the garage – not sure what, but there’s bound to be something that will benefit. She told me the four ducklings she’d rescued sit cuddled up to each other at night and cheep for ages. “ I’d love to know what they’re saying to each other”…. Before going to Tai Chi, I rang Friend to thank her for lunch on Sunday, and found her devastated. They’d taken Smudge the cat to the vet because he’s dribbling blood and saliva. He has cancer of the jaw, and they’ve brought him home to try to eke out a few more weeks with him…. Tai Chi was freezing in the scouts hall. Coldest night for a long time. I noticed how pinched all our frozen old faces were by the end – and even the few young ones! Friday I rang Friend, she was struggling to get the cushion covers off the sofa, where Smudge had taken refuge from the icy night. They were covered in blood and saliva, so I promised to get my sheets from the veranda washed and dried by tonight so that she can drape them over the two sofas. Then took her for a consolatory coffee at the Market, where we gorged ourselves on good coffee and delicious lemon cake well blanketed in whipped cream… so much for diabetes and arthritis! As I was writing this, I heard the noise of many children all chattering at once. Got up to look out of the window to see why, and saw two little girls making their way down the steps. I got to the door as they did, and was assailed by both of them talking at once as loud as they could. They were collecting for an animal charity, and the commotion was simply two seven year olds talking at once, and neither listening to the other. I emptied my purse of change and they went on their way well pleased. So this is life, what happens between getting up to make a cup of tea to take back to bed in the morning, checking the e-mails and reading blogs, keeping the fire piled high with dry logs, and going back to that warm bed at night, with the electric blanket on high, a tray of tea for last thing, and a good book! This is the raw material, and whether we make a silk purse out of it, or see it as a sow’s ear, it’s up to us. It can be satisfying or it can be boring, but the choice is ours. But as I go through my gratitude list at night before slipping into sleep, there seems much to thank the God of Small Things for. Friends dropped in for glass of wine, and apart from a tin of olives stuffed with anchovies, which is a waste of good olives and anchovies to me, I had nothing for the wine to soak into. (I’ve taken to heart the advice to always have a few bites of something first, so the sugar in the wine doesn’t go straight into the blood stream. I also find the wine tastes much nicer if it isn’t sipped on an empty stomach). A dash to the village shop, and I came home with a little pack of the cheapest blue vein cheese, and a carton of cream cheese. Mixed together they make a lovely spread on little chunks of crusty roll, or any good water biscuit. It was enough. From Christian Faith and Practise in the Experience of the Society of Friends. It has to be real coffee. I can’t bear the taste of instant coffee with that smell of dry cleaning fluid lurking beneath the coffee fragrance. No tea bags either. I reverted long ago to a tea-pot and a tea caddy. I love the meditative ritual of boiling the kettle, spooning the tea leaves from the caddy, and enjoy using a beautiful circular shaped silver spoon with a little intricately worked handle. I wonder who used it for this purpose in the past. When the tea is made, the pot goes on a tray with a cup and saucer with Redoute roses on it, a matching milk jug and tea plate. There’s also a little cream French provincial jug which holds hot water to make the tea weaker if I want. It’s Twinings’ lapsang souchong, the delicate smoky taste such a habit now that I never drink anything else. I sometimes think that this will be my greatest deprivation when I’m shunted into an old people’s home – which is why I’ll be drinking a nice pot of hemlock before that happens.It’s the same with the ritual of the breakfast coffee and tray. It gives me such a sense of well being to enjoy these pretty things, instead of keeping them for best, and to eat and drink good, honest, unpolluted foodstuffs. There’s also a feeling of mindfulness as I savour these little things. There’s no way I’d have mucked- around butter on my table either. We have the real thing, not some mixture with chemicals and oils to pretend to ourselves that it’s better for us than butter. I simply can’t believe that a pure substance like butter could be bad for you when the other is filled with all sorts of food substitutes. The fact is, I don’t want any substitutes in my life. I want the real thing. I don’t want plastic plant pots in my garden, I want lovely terra cotta pots, the sort you find in Beatrix Potter’s pictures of Peter Rabbit in Mr McGregor’s garden. I don’t want hybrid dwarf ageratum and stunted shasta daisies and miniature dahlias in the garden. I want the old fashioned blue ageratum with long stems to loll for most of the year at the back of the border. I want tall straight Shasta daisies, not mean little blooms cowering among the lavender, and in autumn I want those big shaggy dahlias shaking their blowsy heads at the sun, not struggling to find a space among the marigolds. Same with bouncy blue agapanthus. Who wants miniature agapanthus when the real thing is so gorgeous? I’ve always hated synthetic fabrics. Give me real wool and cotton, linen and silk any day, whether we’re talking clothes or furnishings. And now they’ve discovered that many of the synthetics we use in curtains and carpets emit fumes which are dangerous to health – so why use them? Same with many building materials in modern homes. Houses of yesteryear, built using natural products were not unhealthy like so many modern homes. And we now also know that many of the synthetic fabrics in homes are easily inflammable and burn fast, unlike wool which takes a long time to catch fire. Apart from the safety and health aspect, natural fibres and natural building products are beautiful. Worse, our devotion to synthetics and plastic means that we’re using up oil to create much of the litter that’s strangling our planet. The monstrous islands of rubbish as big as continents in the oceans, are made up of plastic. The plastic breaks down into tiny shards and gets into the fish food chain, and finally into us. Serve us right. Then there’s plastic bags! When I lived in Hong Kong over forty years ago, plastic hadn’t caught on, so we’d take home our food from the markets wrapped in real leaves and tied with real dried reeds. These small parcels were exquisite little works of art, and every Chinese shopkeeper and hawker could create them and tie them with the same instinctive skill. Even in English villages back when, we used string bags to carry our groceries home, not disposable plastic bags. Disposable of course, is a misnomer. Throwaways, yes, but then it takes aeons for the plastic to decompose. And yes, in my day, of course we had the real thing – cloth nappies. And though the debate rages about the good and bad effects on the planet of disposables versus cloth nappies, at least you can go on using cloth nappies for years afterwards as dusters, car cleaning cloths, and so on, if you don’t pass them on to someone else. Actually, the debate over babies having the real thing is not funny, but is sometimes a matter of life and death in developing countries.The big global conglomerates, many of them American, have run such successful campaigns convincing Third World and Asian mothers that their babies are better off with powdered milk, that in Thailand for example, only five per cent of mothers now breast feed their babies. Babies all over the undeveloped world are being fed milk products which too often are mixed with polluted water, for lack of good hygeine. In China, unscrupulous middle-men added industrial additives to New Zealand milk powder to make it go further, and make bigger profits, with the result that thousands of babies ended up in hospital with serious permanent internal damage, and many died. So having the real thing is actually not a frivolous matter. It can be the difference between life and death. And what can be more real than a mother’s milk? So having got this off my chest, I’m now going to make Welsh rarebit for our light evening meal. It’ll be brown bread, cooked by the local artisan baker, unprocessed cheddar cheese, real butter, and to my chagrin, the milk will be the processed stuff we all have to consume by law. No-one nowadays knows what fresh untampered -with milk tastes like. In my childhood, the cream used to sit at the top of the bottle of real milk delivered to the doorstep, and in cold weather, the sparrows would peck through the lids to get at the cream. They knew the real thing when they saw it. Cheese goes further when used as Welsh rarebit, rather than straightforward cheese on toast, and the difference in flavour and texture is rather attractive for a change. So using an ounce of butter and a level tablespoon of flour – somewhere between half to an ounce, melt the butter and stir in the flour until smooth. Add enough milk, or milk and half beer, to make a stiff mixture. Then add a teaspoon of mixed mustard, a few drops of Worcester sauce, salt and pepper, and about six ounces of grated cheese. Stir it altogether and make sure the cheese is amalgamated. Don’t overcook or the cheese will become oily. Spread this mixture on four slices of buttered toast, and grill until golden brown. Serve at once. This amount will satisfy two greedy people, or four well-behaved people.